This is the history of Elias Francis "Forney" Jordan as told by him. He was born in Galveston, Texas on January 28, 1850 to John Jordan and Eliza Jane Jordan. He was ninth in order of birth in his large family. He was named by an uncle in Texas at whose home they stopped an their way to the west. The baby was nicknamed "California," later shortened to "Forney" in honor of the Golden State which was their destination. After six months in Texas, the ox train progressed on to San Diego, San Luis Obispo and then to San Juan, Monterey County, where they settled. John Jordan, his father, engaged in the cattle business for seven years, later purchasing a farming tract at the head of the Yokohl Valley. From the age of seven years, he made his home in Tulare County, receiving his education in the public school in the vicinity of the parental home which was located on Section 13. Townshipip 18, Range 26 at the mouth of the Yokohl. He remained at home until he was 29 years old, helping his mother in the management of the farm. During this time, he had, however, taken the opportunity to locate a homestead of 160 acres in Section 20, Township 18, Range 26, three miles north of Exeter. In 1880, Forney moved to this land and made his home there, eventually purchasing another quarter of Section 20, engaging in the raising of grain. In addition to this property, he had rented in connection with his brother J. B. Jordan as high as 5,000 acres for raising grain. They were successful in their efforts and continued together for same years until they dissolved their partnership. In addition to his home property, he also owned 80 acres. At that time, he planted grain to 5 quarter sections of land, 800 acres in all. In the operation of this enterprise, Forney used the first combine harvester used in this area. He was also largely interested in the raising of cattle, horses and hogs and in this line, as well as with his farming, he met with gratifying success. John L. Hamilton's Harvester Drawn by twenty six head of horses. Picture taken July 4th, 1892. William (Billy) McNay sower $2.00 per day. Billie was the husband of Alice Jordan. Others in the picture are Charlie Paine, L.B. Kind, and Joe daly. 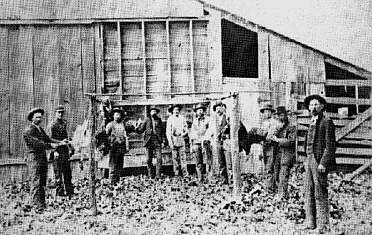 In the 1870's, Forney and Jacob Epperson I, drove a flock of 1,500 turkeys to San Jose to market. When herding the turkeys, they used a large wagon for their provisions and they would alternate days where one would drive the turkeys and one would drive the wagon. At evening, they would extend poles from the side of the wagon on which the turkeys would roost. On a dry creek bed near Los Banes, coyotes got after the turkeys and scattered them to some extent. It took them several days to round them up, delaying the drive. This is one of the many things they would encounter on their drive to San Jose. To cross the river or stream, they would take one turkey across and then this turkey would cause the others to fly over to it. This was a long, slow trip and they were fortunate if they made ten miles a day. This picture was taken November, 1897 showing picking and dressing turkeys for the Thanksgiving market. The turkeys were shipped to San Francisco by rail. This picture is at the Dale Ranch, north of Exeter. E.F. (Forney) Jordan and Jim Jordan had rented the ranch for raising turkeys. Pictured ( L to R) are Billy McNay, George Myers, Steve Myers, Forney Jordan, John A. Dahlem, Jim Daly, Monroe Kelley, John Myers, Jim Fancher (registered first cattle brand in Tulare County) , and J.B. (Jim) Jordan. In Farmersville, Tulare County on July 23, 1879, Elias Francis was united in marriage with Lourissia Ann Hill, a native of Burlington, Iowa. Lourissia was born in Burlington, Iowa on May 31, 1861, during Civil War days when her parents ranch was raided by "bushwackers" who ran off the livestock. In 1875, her parents brought their six children to Tulare County on one of the immigrant trains the Southern Pacific sponsored at that time. Three families were in one car and did their cooking in that car. They left the train at Goshen where there was a depot and a saloon. Her father's brother, Rev. Hiram Hill, was an early day minister in Visalia. Grandmother attended the old Hamilton school, long since gone, which stood on the "hog wallows" near the old Hamilton cemetery. At that time, Indians still camped in the vicinity and there were only grain fields where many fruit ranches now exist. She was the last surviving charter member of the Orange Blossom Rebekah Lodge and an early day member of the Exeter First Baptist Church. 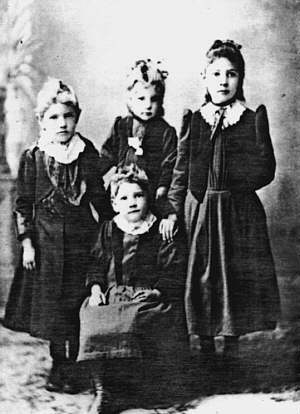 Forney and Lourissia were parents of five daughters and one son: Elva Alma, who died at the age of one year and two months, Alice, Lenora, Frances, Estell, and son Grover. They, and their family lived in several different places around the area. At the time they were raising their family, they lived at the ranch three miles north of Exeter. They later moved to a home in Exeter now known as the old Pigg residence. They then moved to a ranch at Goshen and later moved back to the original ranch near Exeter where they built a new home.